Fortunately, not everyone accepted the cholesterol theory and some researchers kept working to discover what actually caused heart disease and arteriosclerosis. A researcher called McCully was faced with the death of an eight-year old boy that suffered from a rare disease called homocystinuria and had died of a stroke. After this particular case , several others were identified. In every single case of homocysteinuria, the arteries of these patients were abnormal, with hardening and loss of elasticity that greatly increase the tendency for heart attacks and strokes. Most patients with homocystinuria die at a young age due to blood clots in the brain, heart and kidneys. All showed the hardening of the arteries and loss of elasticity associated with fibrous plaques. An abnormal reactivity of the blood platelets was evident in these patients, which accounted for the tendency toward formation of blood clots. Somehow, the presence of elevated homocysteine in the blood had caused the blood platelets to cluster more readily. People with homocysteinuria have a gene defect in which the amino acid, homocysteine cannot be metabolized by the liver as usual and builds up to toxic levels. After a few years it appeared how vitamin B6 supplementation had a dramatic positive effect on some of these homocystinuria patients. Apparently, a simple vitamin B6, could lower homocysteine levels and cure heart disease in these patients. Unfortunately this concept was not recognized at the time when all focus was put on cholesterol as a cause of heart disease. Soon thereafter, upon studying more and more patients with this rare disease, it appeared that there are two more vitamins involved: vitamin B12 as well as folic acid. Why was McCully so sceptic of the cholesterol hypothesis? 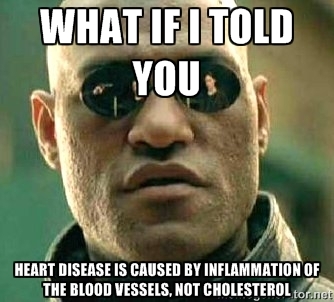 Cholesterol makes up so much of the human body and is so intimately involved in metabolism and physiology, that it is impossible to see how a substance that is so vital to the body, can be so toxic that it causes arterial damage! It did not make any sense to him and thus emerged the seed of the inflammatory concept of cardiovascular disease, now widely accepted. We can be grateful to researchers like McCully who plodded on in times of 'adversity' and stubbornly kept doing where they believed in! By now, the cholesterol myth has been widely refuted and replaced by the better proven theory that arteries are hardened due to excessive homocystein production. Other causes for a too high homocystein level are dietary factors such as smoking, overconsumption of transfats, food that is prepared at too high temperature, drinking too much coffee or alcohol, eating too few veggies. The use of some medication (birth control pills especially) can also deplete B-vitamins and trimethylglycine, resulting in chronically high homocystein levels. For everyone whose diet could use some improvement or who is taking meds, taking extra B-vitamins and more specifically homocystein depleting B-vitamins would be an easy way to diminish the risk on heart disease. Methyl donors are required for converting homocysteine back into methionine and for the accurate synthesis of DNA and RNA, which is essential for the production of normal cells. Methylation is inhibited by inadequately functioning key enzymes, excessive protein and fat intake, poor diet, inadequate intake of methyl groups, coffee, alcohol or by smoking. Impairment of methylation results in abnormal cell synthesis and elevated levels of homocysteine, a toxic amino acid and a serious health risk. The essential amino acid methionine, which comes only from the diet, is "used up" by the body to help donate a methyl group (CH3 - one carbon linked to three hydrogen atoms) to processes going on in every cell. These processes lead to the conversion of some of this methionine to homocysteine, and then into homocysteine thiolactone. This latter compound is a highly toxic metabolite or byproduct. The remethylation of homocysteine, with the help of folic acid, vitamin B12 and trimethylglycine (TMG), converts homocysteine back into methionine.